Renewable Heating by Mitsubishi Electric – New-build alone is not enough .. When you consider that we are building less than 1% of our housing stock each year – as TV presenter George Clarke reports in his latest piece on The Hub, it is clear that we cannot simply ‘build’ our way to a sustainable future. The nation needs to be 80% cleaner by 2050 in terms of carbon reduction but about 80% of our current buildings will still be in use by 2050, so this is a massive issue that we all need to tackle. We therefore have to find a way of making existing buildings carbon-free and renewable heating is a major part of achieving that. Which brings me back to the new Manchester development that I started with. 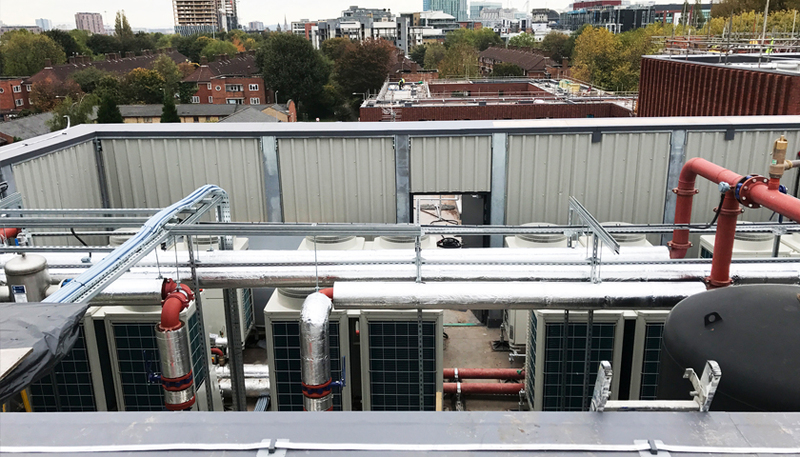 The development uses 8 commercial Ecodan air source heat pumps as a community heating system to provide heating and hot water to 105 apartments. This has helped the developers meet environmental planning requirements by achieving strict carbon reduction targets (more than 35% above Standard Assessment Procedure) to gain planning permission. Building work began in November 2016 and Proline Mechanical was the installation company assigned to the project. Proline is one of the UK’s leading building services engineering and maintenance contractors specialising in detailed revit design, thermal dynamic modelling, BIM, engineering installation and commissioning of mechanical and electrical services. The ASHP system boasts a capacity of 344KW and can operate at sufficiently high temperature to provide heating and DHW. These systems can also guarantee performance down to -10°C and will happily continue working down to -20°C. The industry has already looked at community heating in a variety of forms and one of the occasional issues that arise relate to individual control and bills, and what happens if the entire system fails – does everyone lose their heating? Well that is where a community heating scheme based on modular heat pumps working together can have further benefits. Not only does the system allow each apartment to control their own heating and hot water requirements, working out exactly how much energy each property is consuming, because the community heating uses a number of heat pumps – in this case 8, if there is an issue with one, or when it needs to go offline for annual maintenance, then the other units on the system pick up the slack and ensure that everyone still keeps receiving heating. The system also utilises a 6,000 litre buffer tank to store thermal energy for short peak demands and although this particular project is a new-build, there is no reason why the technology cannot be applied on a wider scale, to a huge variety of different projects. To find out more about renewable heating by Mitsubishi Electric please click here.